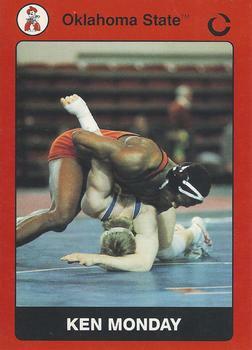 The 1988 Olympic Gold Medal winner Seoul, Korea, Monday became the eighth O-Stater to win the gold in wrestling. Monday picked up his second world title by winning the 1989 Freestyle World Championship. Monday was the first American to win the Tbilisi Soviet national tournament in 1988. Monday, a 150-pounder in college, was a three-time All-American, finishing second his sophomore and junior seasons and taking the national crown in 1984, his senior season. Monday’s totals rank him fifth in OSU’s career won-loss record with a 121-12-2 mark. His 51 career falls place him second on the chart and his 18 falls in the 1984 season rank him fourth best in season falls.